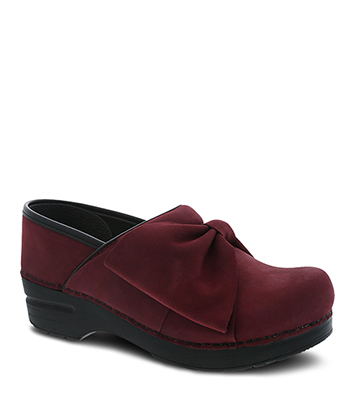 The Dansko Wine Milled Nubuck from the Pro Bow collection. The Pro Bow is APMA-accepted, has leather uppers treated for stain resistance, is built by hand via stapled construction, and has an anti-fatigue rocker bottom that sets feet in a forward motion for shock absorption and energy return. Milled nubuck is a leather that has been tumbled to provide a textural / grain effect. Wipe with a damp cloth to remove surface dirt. Use Dansko Nubuck and Suede Bar and Brush to remove surface stains. For maximum water and stain protection, we recommend using Dansko Suede and Nubuck Spray immediately after purchase.